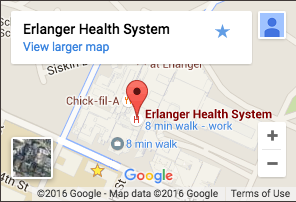 Erlanger is home to the region’s only electrodiagnostic laboratory accredited by the American Association of Neuromuscular & Electrodiagnostic Medicine (AANEM). This means our lab meets rigorous quality standards to ensure that all tests are done correctly and consistently. Our lab provides high-quality electrodiagnostic testing for adult and pediatric patients. Neuromuscular Medicine is a subspecialty of Neurology that is focused on disorders of the peripheral nervous system (PNS). This includes some components of the spinal cord, the peripheral nerves (including nerve roots), muscles, and the connection between nerves and muscles (neuromuscular junction). The term “electrodiagnostic testing” is used to encompass a variety of forms of diagnostic testing used to evaluate the peripheral nervous system. You will be seen by a Neuromuscular Specialist, who will determine appropriate testing based on your symptoms. Testing may include nerve conduction studies (NCS), needle electromyography (EMG), and/or peripheral nerve ultrasonography. Electrodiagnostic testing will be performed primarily by a Neuromuscular Specialist, though nerve conduction studies may be performed by a trained technologist. Why am I being sent for electrodiagnostic testing? You are being sent for electrodiagnostic testing due to symptoms suggesting a problem with your nerves or muscles. Common symptoms include numbness, tingling, pain, weakness, muscle cramping, and muscle twitching. Think of nerves as the “wiring” of your body. By using small electrical shocks to the nerves, your Neuromuscular Specialist is able to determine how well your nerves are working. During nerve conduction studies, you will experience very brief tingling or twitching. Most studies require examination of several nerves. For this test, a small, thin needle is inserted into the muscle to assess the electrical function of the muscle; electrical activity within the muscle reflects the health of the nerve connected to the muscle as well. A new needle is used for each patient, and is thrown away after the test. There may be a small amount of discomfort when the needle is placed. The number of muscles examined will be limited to those needed to evaluate your symptoms in order to minimize associated discomfort. Will peripheral nerve ultrasonography be performed? Peripheral nerve ultrasonography is a painless way to evaluate the structure of your nerves and may be performed if requested by your physician or felt by the Neuromuscular Specialist to be indicated for the evaluation of your symptoms. Testing typically takes between 20 and 90 minutes; the duration is dependent upon the complexity of your symptoms and medical history. If requested by your referring physician, testing may also be accompanied by a brief consultative visit. Please bathe the evening or morning prior to testing; DO NOT use skin lotion after bathing. Clean and lotion-free skin requires less electrical current for nerve conduction studies, thus minimizing associated discomfort. Please complete the provided Patient Worksheet, as this will help your Neuromuscular Specialist both in performing testing and developing a management plan designed specifically for you. If being tested for myasthenia gravis, please contact us prior to testing for instructions regarding your medications. The Neuromuscular Specialist will typically discuss the test results with you immediately following testing. If requested by your referring provider, this discussion may also include further steps in evaluation/management and possible initiation of treatment. We look forward to meeting you! Feel free to contact us at 423-778-9001 if you have any further questions or concerns. Please complete the appropriate worksheets, print and bring to your appointment.